Robert Ambrose Cole grew up in urban Alice Springs and encountered a variety of influences before he began to paint at 29 years of age while working for the Central Australian Aboriginal Media Association (CAAMA). His earliest works relied on the conventional imagery of sites and symbols attached to the country and people of his parents, the Warramunga of Banka Banka, north of Tennant Creek and the sandstone hills at Aputula, Finke, on the edge of the Simpson Desert. Cole came into contact with artists with whom he shared ancestral heritage in the Eastern Desert through the first Utopia painting workshops organised by CAAMA in the late 1980’s. He began to paint inspired by both the tradition-based art movement emerging from Utopia, and the European-influenced landscapes of the Hermannsburg watercolourists, and although his work remained predominantly conceptual throughout the short six years that he painted, the tension between the figurative and the abstract remained a continuing theme throughout his work. Employing a technique of wash and overlay, Cole experimented with delicate and sensitive blends of colour and tonal relationships, often generating a glowing otherworldly patina across the surface of his paintings. Areas of dots depicted simple forms within an expansive and highly charged field. Robert Ambrose Cole was an unassuming man who approached his art with great caring and sincerity. His paintings stand apart from prototypical desert artworks with their conventional narratives, partly due to his conscious abstraction and also by his reluctance to explain his imagery. Though his style varied, many of his more recognisable works were inhabited by a particular kind of meticulous and evenly laid white dotting. This, and the decidedly spiritual or contemplative feel imparted by his paintings, is the one constant in a body of work that spanned a career that began just six years prior to his death in 1994. Yet despite the fact that the vast majority of his paintings lacked complexity, their evocative influence prompted art patrons, curators and critics alike to make profound statements when commenting on his work during his lifetime. While the creation of surface vibration by varying dot size and spacing is part of a continuing aspect of Aboriginal painting, Cole strove for a precision that differentiated his work from other artists working in the same vein. 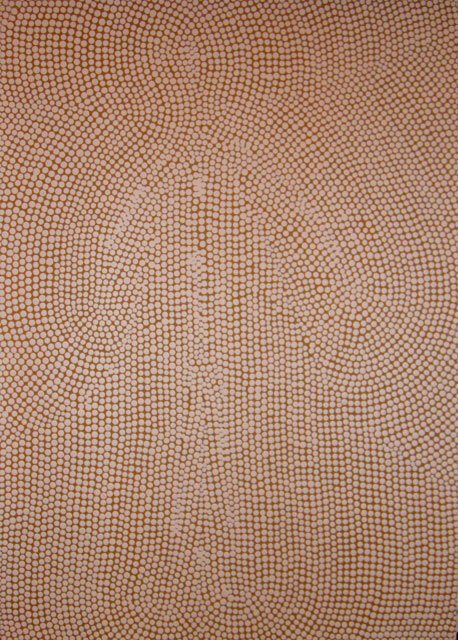 Figures and shapes below the surface were contained and defined by the overlaid dots to give the effect of a shimmering mirage - like illusion (not dissimilar to that of op art). In the work illustrated above we can make out the form of a spirit figure within a seemingly uniform field of dots. It was created while painting in a contemplative state. Through this act the artist has produced an image that has all the hallmarks of a religious icon, inviting the viewer to stop and reflect on the profound way in which we can be spiritually moved by art. The ambiguity between distinct structure and dissolving boundaries found its fullest expression in the works painted immediately prior to his untimely death through illness at the age of just thirty-five. Cole only lived long enough to have two 2 exhibitions yet within the brief span of his career his work was included in a number of important art awards; was issued on a stamp by Australia Post, and most importantly, included in Australian Perspecta at the Art Gallery of New South Wales in 1993. Robert Ambrose Cole was represented exclusively during his lifetime by Sydney dealer and fellow artist Christopher Hodges, owner of Utopia Art, Sydney and through him, Mary Reid Brainstorm’s Austral Gallery in St. Louis, U.S.A.
His original works were almost exclusively small with a large proportion created on paper. With only thirteen works having sold at auction of eighteen offered, including many works on paper and prints, his highest result is just $11,162. However no less than half of these works have sold for more than $5,000. Most of those works that have failed to sell have been screen prints carrying overly high estimates. While his best year at auction was 2000 when both his highest and 4th priced paintings sold at Christies, his most prolific years in the salesrooms have been 2005-2006 during which 5 of 6 paintings offered sold for a total of $30,200. His works are highly desirable and eminently affordable at an average price of just $4,673. Collectors would be wise to keep an eye out for any that come up for sale. With estimates running in the $8,000-$10,000 range these works certainly seem to represent very good value given their rarity.